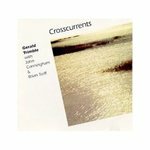 "Crosscurrents (CD)" by Gerald Trimble, John Cunningham et al. Brian Torff is a contributing artist (bassist) on this CD. Trimble, Gerald; Cunningham, John; and Torff, Brian Q., "Crosscurrents (CD)" (1993). Visual & Performing Arts Faculty Music Gallery. 24.